After much experimentation, I finally got a reproducible series of steps, and thought I’d document them here… This is going to be everything from scratch to printing, so it’s going to be a bit lengthy. I try to make few assumptions about your Blender expertise, other than a cursory knowledge of how to start it and navigate around it. This isn’t too hard, so long as you’re familiar with how Bezier curves work. Since I know a lot of people aren’t used to them, let me give you a bit of background on them. First, and almost useless to us, is the formal Wikipedia description of them. It’s great if you’re looking to implement them in software, but kind of useless if you’re trying to draw with them. Second is the Blender documentation for them. This is handy to keep on hand, but is not a tutorial. You can also google “blender bezier tutorial” to find lots of videos and texts on how to use them. All that being said, let me give you a 30 second description of them. Take out a piece of paper, and draw a square. If you’re normal, you started at one corner, drew a line to the next corner, then to the third corner, then to the fourth corner, and finally back to the first corner. There’s a couple of things that define your drawing of the square. The four corners, certainly. But if you didn’t draw the last line, closing the square, you would have still drawn the four corners. So then there’s the lines between the corners as well. There’s some interesting things about the lines — they’re straight (let’s pretend they’re perfectly straight for the moment), and then come in and out of the corners at right angles. If you look carefully, you can see the lines have little arrows on them showing you how the square is being drawn. 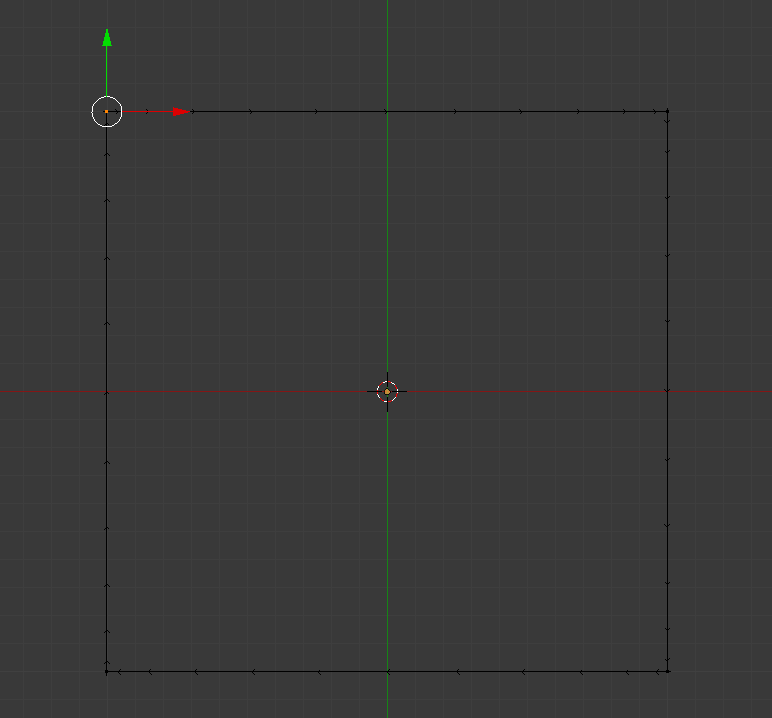 At each corner of the square is a “control point”, so called because that’s where the overall direction of the curve changes; the control point describes how the curve comes into the point and leaves. 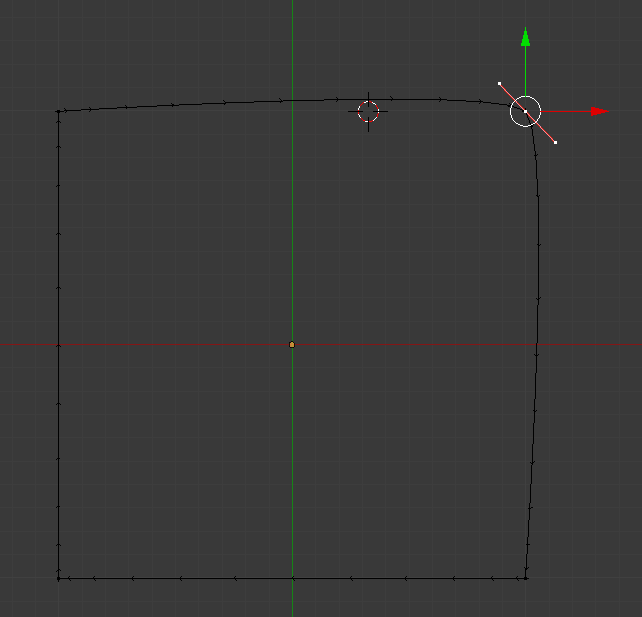 In this case, the curve makes a sharp turn directly for the next control point; that’s what makes the square square. While there is a precise definition of how these handles work, I find that if you just drag them around a bit it become fairly obvious how they behave. A line between two control points is affected by the handle controlling how it leaves the first control point and the handle controlling how it comes into the second. 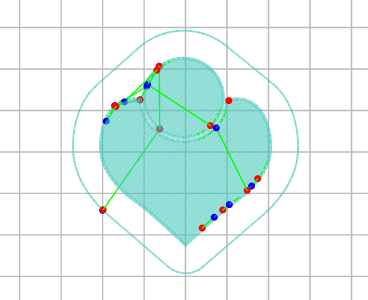 I’ll walk through the steps of creating the heart and you will see how the control points, handles, and overall Bezier curve can be manipulated to make the heart just right.